This Deluxe Portable stylist station offers premium organization and display of your styling tools. 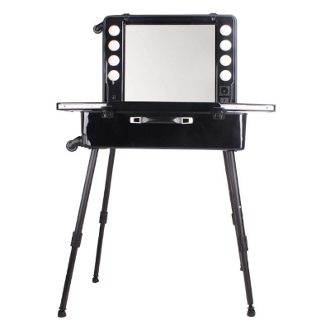 This free standing stylist/make up station quickly sets up to add additional LED mirror with work space to your salon. Black high gloss rolling hard case with retractable handle. Lockable. Includes protective storage dust cover and strap. Telescoping legs quickly attach and set up your work station. Open the top of the case to showcase a beautiful LED lit mirror with large organization storage and work display trays. Storage trays slide outward to display more work space. Includes suction cup bottom hot tool holder as well as zip up interior storage case. Unit transforms quickly from a rolling case to upright well-lit working station. Closed case: 25”L x 18” W x 9” Depth. Telescoping legs detach and lock unto back of case for storage. Shown in photos as closed rolling case, shown with case opened up, shown with telescoping legs attached.